KE00031 is a solid phase sandwich Enzyme Linked-Immuno-Sorbent Assay (Sandwich ELISA). 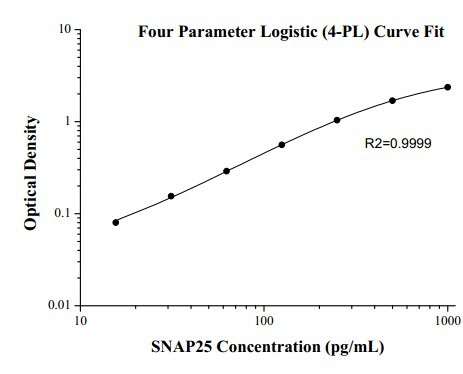 The SNAP25 ELISA kit is to be used to detect and quantify protein levels of endogenous SNAP25. The assay recognizes human SNAP25. A polyclonal antibody specific for SNAP25 has been pre-coated onto the microwells. The SNAP25 protein in samples is captured by the coated antibody after incubation. Following extensive washing, a monoclonal antibody specific for SNAP25 is added to detect the captured SNAP25 protein. For signal development, horseradish peroxidase (HRP)-conjugated Anti-mouse antibody is added, followed by Tetramethyl-benzidine (TMB) reagent. Solution containing sulfuric acid is used to stop color development and the color intensity which is proportional to the quantity of bound protein is measurable at 450nm with the correction wavelength set at 630 nm. Synaptic vesicle membrane docking and fusion is mediated by soluble N-ethylmaleimide-sensitive factor attachment protein receptors (SNARE) complex which is located on the vesicle membrane (v-SNAREs) and the target membrane (t-SNAREs). Other than VAMP2 and STX1A, SNAP25 is another key component of SNARE core complex, and is known to be involved in regulating neurotransmitter release. Its palmitoylation domain is located in the middle of the molecule that contains four cysteine residues and mutation of the cysteines abolishes palmitoylation and its membrane binding activity. As an important presynaptic plasma membrane protein, SNAP25 has been linked to memory and learning by its effect on long term potentiation in the hippocampus, thus playing a critical role in the synaptic function of specific neuronal systems.